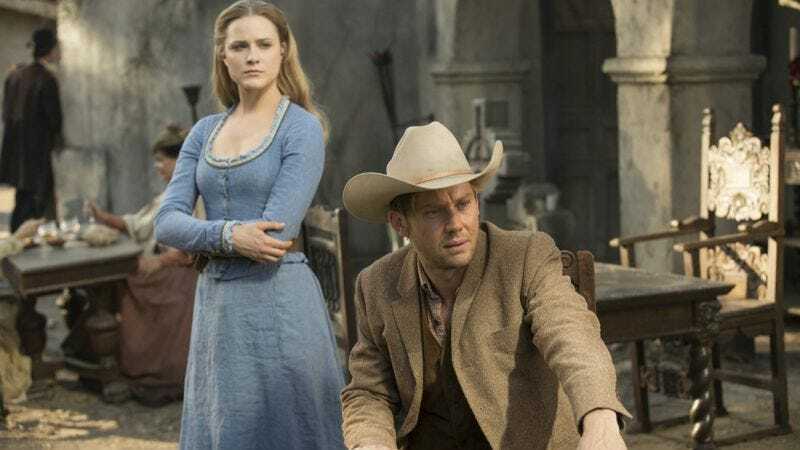 Though it seems fairly safe to say that the cast members of Westworld aren’t actually robots, it turns out they can lip sync with shocking precision. So much so, in fact, that the Dubsmash app rounded up their best lip-syncing antics into one compilation. The nearly four-minute video shows off some truly impressive feats of voice matching, most of which come from Evan Rachel Wood, who appears to be the biggest Dubsmash connoisseur in the cast. But in addition to starring in many of Wood’s videos, Jimmi Simpson posted quite a few himself. Ben Barnes (Logan) is another frequent Dubsmasher, while Shannon Woodward (Elsie) pops up in one of the videos as well. And while Dubsmash is generally associated with lip-syncing songs, the Westworld cast set themselves the additional challenge of lip-syncing dialogue scenes as well, including everything from The Wizard Of Oz to Heathers to Kindergarten Cop. At one point, Wood even nails the Dirty Dancing lift just to really put things over the top. These violent delights have violent ends and all, but also some pretty impressive dance moves.